Take a step back in time with props, costumes, and heirlooms from the past. 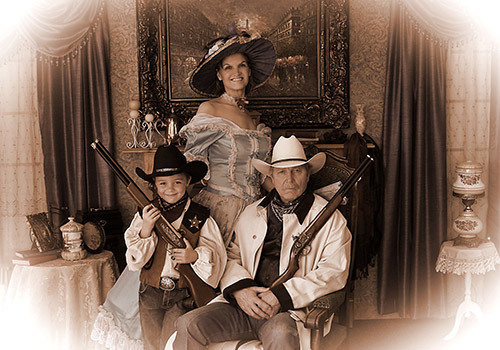 From France to the Wild West, you’ll have the option to dress up in our wide selection of costumes and create memories to last a lifetime. 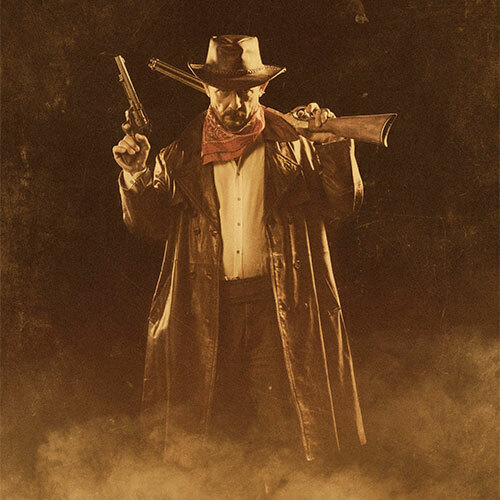 Transform into a 1920s Gangster, a Frontier Woman, a Southern Gentleman, and more! Whether you want a solo portrait or a group photo shoot, we can do it all. It’s a blast from the past. Four Sisters Old Time Photo creates beautiful heirloom portraits. We have hundreds of stunning, new, and clean costumes, hats, and props to fit all sizes. Be swept back to the days of the Wild West, Old South, Victorian Age, or the Roaring Twenties and Flapper Girls. Guaranteed to make memories that will last a lifetime. Four Sisters Old Time Photo Studio specializes in children, families, couples, large groups, honeymooners, anniversaries, and pets. Our professional photographers can photograph from one person up to groups of 200 people. Our family has gathered props from France, England and all over the United States. 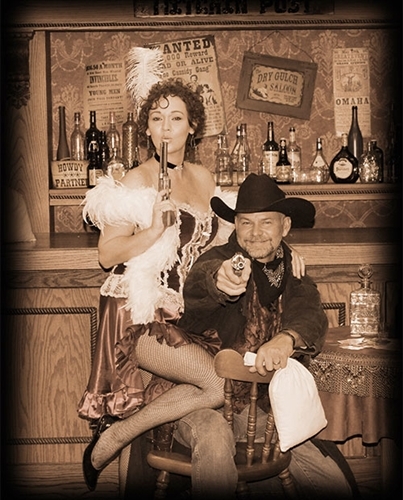 The old-time photo scenes look like real movie sets. 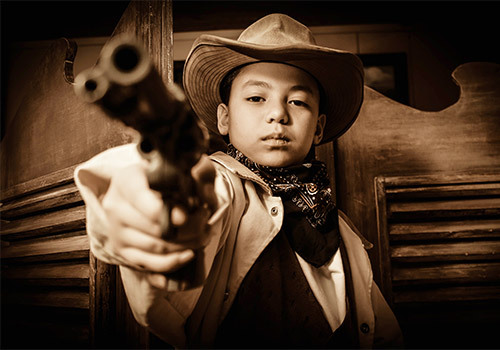 Dress up and be photographed as Old West Cowboy, Frontier Woman, Old West Poker Player, Sheriff, Saloon Girl, Old West Minister, Civil War General, Southern Belle, Southern Gentleman, Victorian Lady or Gentleman, Indian, Roaring Twenty's Gangster or Flapper Girl. Package includes sitting fee and two 8x10 photos. Please choose the ticket based on the number of people in your group. Four Sisters Old Time Photo is open 7 days a week from 10:00 am to 9:00 pm. No appointments are necessary. What size costumes do you have? We provide customers with all sizes, from infants to XXXX large. We accommodate all shapes, sizes, and ages. What can I dress up as? Where are the props and costumes from? Are they clean? Our family has gathered props from France, England and all over the United States. All of our costumes are purchased new and thoroughly cleaned upon each usage.